Tesco is one of the world's leading international retailers. Since the company first used the trading name of Tesco, in the mid 1920s, the group has expanded into different formats, different markets and different sectors. Tesco sells a huge variety of items from petrol to internet, from insurance to food and even loans. Tesco is currently looking at expanding into the US, which is the largest GPD country in the world at approximately $13.67 Trillion. Tesco has a long term strategy for growth, based on four key parts: growth in the Core UK business to expand by growing internationally to be as strong in non-food as in food and to follow customers into new retailing services. Tesco have stores in the UK and 11 other countries world wide. 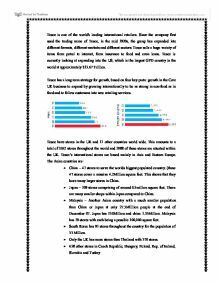 This amounts to a total of 3262 stores throughout the world and 1988 of these stores are situated within the UK. Tesco's international stores are based mainly in Asia and Eastern Europe. The Asian countries are: * China - 47 stores to serve the worlds biggest populated country. (these 47 stores cover a massive 4.2Million square feet. This shows that they have many larger stores in China. ...read more. It stops them using any other retailer. Again keeping customers brand loyal. The main rivals to Tesco in the UK are Asda and Sainsbury's, just because of the fact that they are the other two most established retailers with a substantial customer base. Feb' 2006 Market share Tesco: 30.6% Asda: 16.6% Sainsbury's: 16.3% Morrison's: 11.1% Somerfield: 5.4% Waitrose: 3.7% Iceland: 1.8% Tesco are a clear market leader within the UK. Asda and Sainsbury's are in close competition. 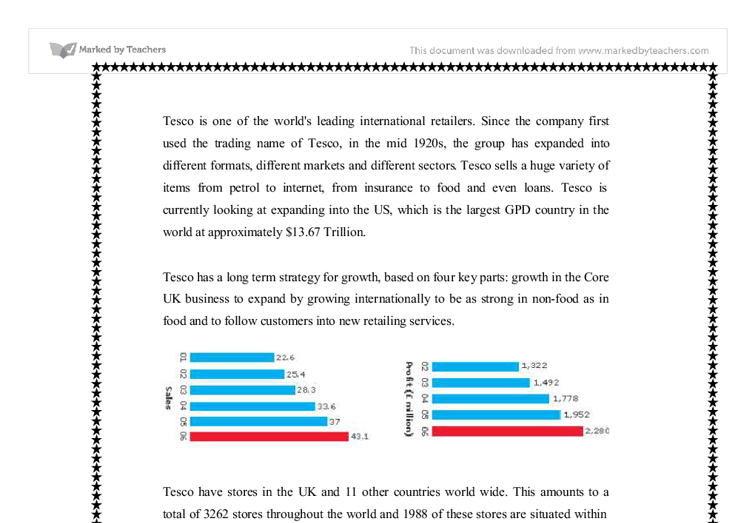 Tesco are ever expanding and increasing their market share in the UK and global market. In the above '06 stats shown, Tesco had increased their share by 0.1% in 1 month. The other competitors had stayed the same apart from Sainsbury's increasing their percentage by + 1% making them ever closer to Asda. There are lots of different positions within Tesco, these all need filling and to get the best possible candidate for the job Tesco has a specially designed recruitment process. There are 5 main general job roles within Tesco, these are Managers, Supervisors, IT Operatives, Administrator & Customer services operative. Manager - Tesco has so many career paths, there is easily over 10 different managers within a superstore. ...read more. The IT department of Tesco isn't just there to provide hardware and software, the contribution of providing a constant helping service is required. So anyone using new software/hardware is given training on how to use it etc. IT solutions are used to improve the lives of their workers and customers. The IT at Tesco is always put to good use in the following areas: * Supply systems create effective stock control and product availability to all customers. * All customers go through the checkouts to pay, so these pieces of technology need to be at their best. Simple and smart but at the same time sophisticated. * Producing new ideas such as the Self Scan Checkouts which can make shopping more enjoyable for possibly a limited period of time because of the novelty. * There are also lots of technologies that customers cannot see/don't realise are implemented. Some technologies like heat sensing cameras that detect when extra tills are needed to be opened before people even realise. In the IT department, there are over 5,000 users supporting Tesco advancing into the future with technological advancements. Administrator - Administration within Tesco again has a broad range of differing job roles. The general idea is that they are involved with all types of paperwork and working with the public and being in the public eye representing Tesco as a brand. ...read more. Tesco Monaghan spends lots of time and money ensuring that all their databases remain secure and are continually updated. Passwords are changed often to maintain a high level of security. Although this has a direct impact on the profits of Tesco such provisions for the collection of information encourage customers to provide information. area outside of Sutton itself as these people do not make regular trips into the small town. The only exception for this would be if a prospective customer works in Sutton but does not live in the town, the bakery could then be used to buy lunch or luxury treats. A good brand reputation can lead to attracting more customers. However, if the company fails to perform its identified goals and meeting the marketing indication, it will be considered as a negative brand reputation and, as a result, lose customers. Evaluate the external corporate communications of Asda and Tesco. short summary on what the company is about and what the values of the company are about. The mission statement demonstrates in a few lines what the aim of the company is and they what the person reading the statement want to go receive the service that they provide from them rather than a competitor.